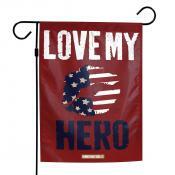 Our US Flags and Pennants include horizontal grommet flags and vertical house flags of various sizes. All of our American Flags are constructed of 100% nylon and have embroidered stars and sewn stripes with quadruple stitched flyends. In addition, our US Flags and Pennants collection includes Army, Air Force, Navy, and Marines flags and pennants. 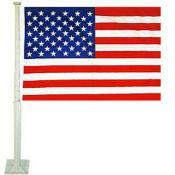 Click on any US Flags and Pennants image for more information including sizes, construction details, and flag styling.